With the anniversary of 9/11 just a day away I want to outline some important points that illustrate how we arrived at where we are today in America. I'm referring to, of course, the America we live in today where Communists and Anarchists under the umbrella of organizations like "Antifa" claiming to be "anti-fascist" are now under a falsely assumed morality violently attacking Americans who disagree with their point of view, predominantly conservatives, Christians, patriots and Trump supporters among others. These attacks of course are not random, they are very much planned and provoked for political reasons. If we were drawing lines connecting key events starting with 9/11/01 to the present day we would want to consider some important points and key events. Below are just a small list of things to consider. 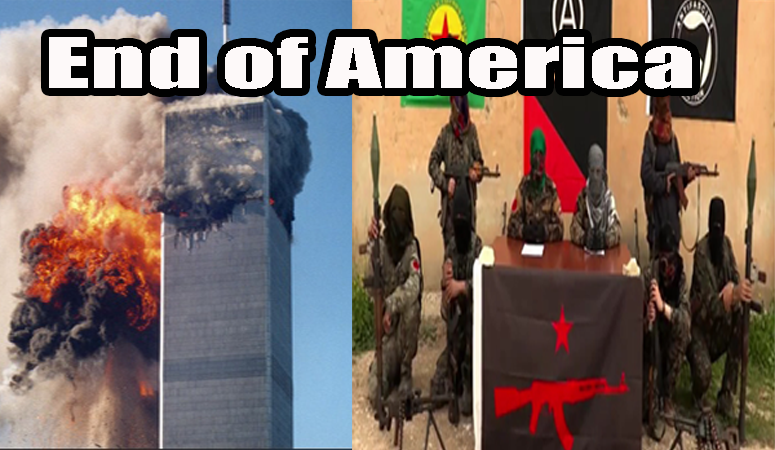 1- Start with the September 11th 2001 false flag attack on America by the globalist ruling elite. As most of humanity already knows today 9/11 was a false flag military operation, a coup d'etat on America, a day when a lot of money and wealth changed hands and no one to this day has bothered to hold anyone accountable. Among many things 9/11 set the stage for the surveillance state, the endless war on terror and paved the road for Obama to act as the savior in a post-Bush era only to destroy America much more than Bush could have ever dreamed of and roll out the new global order agenda overtly. 2- Many things changed over the course of the past 8 years of Obama. One huge concept I want to bring to your attention to is the notion of "civilian armies" as it compares to the historic view of scary military armies. You may wonder, what could be worse than the notion of an armed military oppressing its own people? We've seen this throughout history and no doubt military power under the control of tyrants is a fearful thing. But modern times has shown us that there is another scary reality that can unfold when allowed to do so with the funding of deep state criminals who are trying to overthrow nation states that don't cooperate with their planned global order and that is armed radical militant civilian armies. Yes, armed uncontrolled radical civilian armies or "militants", "rebels" or terrorists, as we have seen today can impose just as much misery and chaos on civilization as any military army. We've seen this also throughout history and we know that this also doesn't end very well. 3- Thus when you think of the new global world order rooted in collectivism and cultural marxism think "civilian armies" and remember that Obama promised in his 2008 campaign that he would create an "army of civilians" who he promised would be "just as strong" and "just as powerful" as our military. Ask yourself, what did he mean by this? 4- Globalization and the undermining of all Western values has accelerated beyond belief. Using a global propaganda campaign to indoctrinate the young and using multinational corporations redefining what constitutes, for example, "harassment" the globalists have become the new thought police attempting to dissolve and override all reason, science, conservative values and natural law itself. This massive global attempt to redefine reality is all part of the war on Truth, the war on the individual and the war on nation states. Many argue this is also a war on god, on faith, on science, reason and logic as well. Christians argue this is clearly synonymous with the so called "mark of the beast" and admittedly the symbolisms and similarities are definitely there. 5- Because of the above redefining of language and meaning of things this new thought police has gone from mocking those who exposed the 9/11 crimes as "conspiracy theorists" to now outright accusing those who disagree with us as guilty of "harassment" which unlike the accusation of "conspiracy theorists" carries with it a presumed guilt and an "act" of criminality to it. If you are "harassing" you are committing a punishable crime. This crime of course will then lead to a loss of wages (getting fired), loss of freedom (jail) or worse. Much worse consequences than being called a conspiracy theorist don't you think? It is very important to stop this madness that now threatens humanity and America and see it for what it really is. It's censorship re-packaged as "anti-fascism" and anti-hate. It's the rolling out of the thought police and the ushering in of the new global order. The video below ties in the road from 9/11 to Antifa. Bernie is a revolutionary writer with a background in medicine, psychology, and information technology. He is the author of The Art of Overcoming the New World Order and has written numerous articles over the years about freedom, government corruption and conspiracies, and solutions. Bernie is also the creator of the Truth and Art TV project where he shares articles and videos about issues that raise our consciousness and offer solutions to our current problems. Recently Bernie launched his own weekly podcast 'Truth & Art Radio' where he offers a summary of important political developments and shares some of the music he has written over the years. Bernie is also a former U.S. Marine who believes it is our duty to stand for and defend the U.S. Constitution against all enemies foreign and domestic. He believes information and awareness is the first step toward being free from the control system which now threatens humanity. He believes love conquers all fear and it is up to each and every one of us to manifest the solutions and the change that you want to see in this world because doing this is what will ensure victory and restoration of the human race and offer hope to future generations.